New Member Open Enrollment for Voluntary Group Life and Disability Coverage New Member Open Enrollment Voluntary Short-Term Disability, Long-Term Disability, and Life Insurance through Principal has begun! Members who joined the BLET on or after November 1, 2018, and are active, dues paying members as of April 1, 2019, are eligible to enroll now through April 30th, 2019. BLET NEWS FLASH Open enrollment for the BLET Short Term Disability Enhanced-Plan coverage http://www.ble-t.org/pr/news/newsflash.asp?id=9190 INDEPENDENCE, Ohio, February 25 - Open Enrollment for the BLET's Short Term Disability Enhanced-Plan through Sun Life will end on February 28, 2019. Those who enroll will have their coverage take effect on March 1, 2019. Q&A: Railroad Retirement Age Reductions May 2018 There are a lot of questions folks have regarding Railroad retirement. This Q&A provided by the RRB might help those who do have questions. Always remember the RRB is there to help you, and is always willing to assist on any question you might have. Give them a call at (1-877-772-5772). Admin. Brothers, Attached is a message from the BLET Mobilization Team regarding the IBT multiemployer retirement plans. Multiemployer Plans are similar to our Railroad Retirement in that participants and their employers contribute to the multiemployer Plan and a benefit when the employee retires is paid to the employee at that time based generally on years of service. Part of having a site such as this is that you can share information to the membership easily and through social media such as e-mails and text messages. With that ability comes a responsibilty both as the owner of the site, and as a member of the CR/SAA CSX North General Committee. ANY information you as a member provide us in registering for this site is kept in strict confidentiality and will NOT be used for any other purpose other than to notify you of information or events that you need to know of. Memebership requests from OUTSIDE the GCA can be accepted ONLY if prior contact is made expressing the desire and purpose for needing access. The reason for this is because of the rise in non-GCA members requesting access and with the limited information that is provided we don't know WHO is requesting the access. For those outside the GCA please contact the GCA office at the number provided on the site, or e-mail: bletcr2vgc@gmail.com stating the BLET or UTU Division/Local you belong to and the purpose/reason you wish access. Also see CSX Article 65 and Conrail Article G-m-8 below!! Increasingly , some claims from engineers are lacking the needed information for appeal. Please take note of CSX Article 65 and Conrail Article G-m-8 where in it states the claimants responsibility to provide information and what info is needed. Please when entering in claims take the time to enter in all pertinent information. One additional note, per Article 65 A 1 (g) below please provide the NAME of the person who ordered you to do the violation contained in the claim. if they won't provide a name, state so in the claim that the "Trainmaster refused to provide his/her name when requested, play radio/phone tapes Ch 64-64 at 0916hrs as proof of instruction "
g. If Claim Involves Instruction, Name and Title of Person Giving Instructions and description of the instructions. Note 1: Employees who are short the equivalent of eight hours or more in their pay, through no fault of their own, will, upon request, be given a voucher. Note 2: This Article does not apply to the appeal of discipline which is handled as provided in related discipline Articles. Final disposition of claims will be shown on the earnings statement furnished employees by the fourth payroll period following the pay period in which the claim was received. Final disposition of claims will be shown on the earnings statement furnished employees by the eighth payroll period following the pay period in which the claim was received. 2. Such claims not declined within these time frames will become payable by default without establishing a precedent. Note: The reason for the declination of a claim must state more than “NOT VALID” or “NOT IN AGREEMENT” if there is an applicable Article within the agreement and, should state in specific language as to the rule or rules being used to refute the Engineers claim. Sufficient detail should be included to be able to understand the facts/positions of the declination. 1. All appealed claims must be submitted electronically to the appropriate CSXT officer within ninety (90) days of declination as shown on the individual’s earnings statement; hand written appeals will continue to be accepted and fall under the same time limits. Once a Local Chairman submits an appeal to a claim, a conference may be arranged between the Local Chairman and the CSXT officer if requested. The conference must be held within 90 days of the request. The conference may be held telephonically or in person. CSXT will arrange to meet with the Local Chairman on an agreed to date and time and at a location agreeable to both parties. Local Chairmen will not be required to come to CSXT Offices in Jacksonville to hold these conferences. The Local Chairman must furnish a list of claims to be discussed at the time a conference is requested. Claims not appealed within this time frame will be in default without establishing a precedent. Note: Claims of a continuing nature shall be considered properly appealed when listed and identified with the initial claim by the Local Chairman to the CSXT Officer. 2. Appealed Claims where conference is not requested must be responded to by the appropriate CSXT Officer within 90 days of the appeal. Claims not declined within this time frame will become payable by default without establishing a precedent. 3. Local Chairman may submit a written request for conference. If a onference is requested, it will be held within ninety (90) days of the written request. Failure by CSXT to schedule the conference will result in a payable claim without precedent. Failure by the Local Chairman to participate in the scheduled conference after it has been requested will result in a withdrawal of the claims without precedent, unless other arrangements are made. When the conference is held within the 90 day period, the CSXT officer will have an additional ninety (90) days from the date the conference is held to respond to the appealed claim(s); otherwise the claim(s) will become payable without establishing a precedent. D. Once the claim has been declined by the CSXT Officer, the General Chairman of jurisdiction may request conference at his discretion. Conferences with the HDO will be conducted within thirty (30) days of such request. In any case, the General Chairman of jurisdiction must progress and docket such claim before a tribunal having jurisdiction pursuant to law or agreement within one (1) year of the appeal response. E. Time limits at any level in this rule may be extended by the General Chairman and the Highest Designated Officer by mutual consent. F. The postmark will serve as the governing date for compliance of all written correspondence exchanged pursuant to this Article. from the Local Chairman. If unable to come to an agreement as to the settlement of the grievance, the matter will be referred to the DRC and handled as per Article 32 Disputes Resolution Committee. 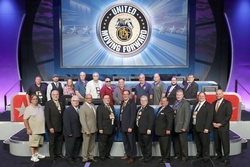 Q-1: In order to learn the electronic claims system for the inputting of Appeals by Local Chairman, will CSXT be responsible to train all newly elected Local Chairmen in the use of any computer systems that the Local Chairmen require instruction on in order to carry out their duties as Union representatives? A-1: It will be the responsibility of CSXT to coordinate with the appropriate General Chairman in the scheduling of classes for newly elected Local Chairmen for instruction on the use of CSXT computer screens that are necessary for the handling of Union business. CSXT will pay for all travel and expenses incurred as well as any lost earnings,if applicable, but in no case less than a minimum days pay for each day of travel and class when Local Chairmen are required to attend an agreed to class for this purpose. Local Chairmen provided such training will be required to use the electronic system. Q-2: What is the definition of a Grievance? A-2: A grievance is any matter that does not seek compensation and is not initiated by a time claim or time ticket submitted by an Engineer. (a) A claim for compensation alleged to be due may be made only by a claimant or, on his behalf, by a duly accredited representative. Not later than 45 days from the date of the occurrence on which the claim is based, a claimant or his duly accredited representative must submit the claim on the form provided for the purpose, either in writing or electronically, to the officer of the Corporation designated to receive such claims. A claim submitted in writing must be presented in duplicate and the representative of the Corporation who receives the time slip from the claimant or from his duly accredited representative must acknowledge receipt of the time slip by signing and dating it, and returning the duplicate copy to the claimant or his duly accredited representative. A claim submitted electronically must be submitted on the electronic time slip form provided for that purpose. A copy of the electronically updated input of the time slip will serve as acknowledgment of receipt. If not presented in the manner outlined in paragraphs (a) and (c) of this Article, a claim shall not be entertained or allowed, but improper handling of one claim shall not invalidate other claims of a similar nature. (b) If a claimant is absent because of sickness, temporary disability, leave of absence, vacation, or suspension, the 45 day time limit shall be extended by the number of days the claimant is absent. 8. Claim being made, including the rule under which claimed (if known) and the reason supporting claim. Items normally associated with the service time slip such as, conversion to local freight rate, deadheading, held away-from-home terminal, meal allowance, and terminal delay shall continue to be submitted as part of a service time slip. (d) When a claim presented in accordance with this Article is not allowed, or should payment be made for less than the full amount claimed, the claimant shall be informed of the decision and reason therefor within 80 days from the date the claim is received. When not so notified, the claim shall be allowed, but such payment shall not validate any other claims nor shall payment establish any precedent. (e) A properly submitted claim which has been denied in accordance with paragraph (d) shall be considered closed unless the Local Chairman or other duly accredited representative, within 90 days from the date of denial, lists the claim in writing or by electronic mail with the Carrier’s highest designated officer at least 30 days in advance of a meeting. In the appeal, the Local Chairman shall either request to discuss the claim in conference or waive discussion and request a written or electronic response. Any appeal which omits a request for conference or waiver of conference will be scheduled for conference. In either case, the appeal shall include a statement of facts and a position, or a reference to the facts and position in a prior claim. A conference to discuss the claim will be scheduled to convene within 60 days of the highest designated Carrier officer’s receipt of the claim, unless either party requests that the conference be scheduled for a later date. Telephone or video conferences may be used to fulfill the requirement to meet in conference. When a claim is denied, the Carrier’s highest designated officer shall notify the Local Chairman in writing or by electronic mail of the reason(s) for denial within 90 days from the date of receipt of the request for a written response or the date of the meeting, whichever is applicable. The Carrier’s denial shall consist of a statement of facts and position or a statement of position only. If the Carrier’s denial does not include a statement of facts, it is understood that the Carrier’s highest designated officer does not contest the facts as presented by the Local Chairman. (f) The decision of the highest designated officer of the Corporation designated to handle claims shall be final and binding unless within 60 days after the date of that decision the claimant’s Local Chairman submits the claim to the General Chairman and unless within 180 days of the date of that decision, the General Chairman notifies the officer in writing that the decision is not accepted. In the event of such notification, the claim shall become invalid unless, within five years from the date of the Corporation’s decision, the claim is disposed of on the property or by a tribunal having jurisdiction pursuant to law or agreement. The parties may agree to other proceedings for final disposition of claims. (g) At least two weeks prior to the date a claim is scheduled to be heard by an arbitration panel, the parties will be afforded a final opportunity to fully develop their positions during handling on the property. Neither party shall be limited by the positions taken during prior handling. (h) The time limit provisions of this Article may be extended at any level of appeal in any particular claim by mutual consent of the highest designated officer of the Corporation and the designated representative of the Organization.